Welcome to PreciseShooter! How to make a sniper rifle. Part 3: Cleaning a Mosin Nagant. How to make a sniper rifle. Part 3: Cleaning a Mosin Nagant. 1) A coated single-piece cleaning rod. Avoid rods with exposed metal surface, and especially multi-segment aluminum rods that need to be screwed together: they can damage the rifling in the bore. You need a .270 caliber and up, at least 36". For example, "Bore Tech V-Stix 1-Piece Cleaning Rod 270 Caliber 36" Coated Steel" can be had from http://www.midwayusa.com/ for ~$25 as of this writing. 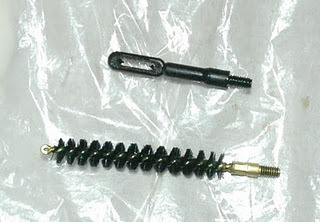 2) A nylon brush and a nylon or coated patch puller. 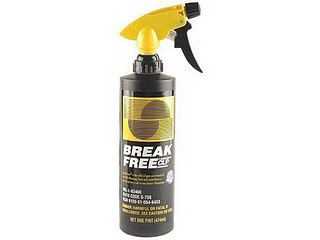 Do not use brass, it does not work well with the cleaning solution I will recommend below! ~$2 per accessory. Also, http://www.midwayusa.com/. 3) A bore guide. This implement inserts into the rifle chamber and guides the rod so that it goes into the bore parallel to the symmetry axis and does not damage the rifling near the entry point. ~$20-25. Note: I have not found the bore guide that fits Mosin Nagant perfectly. I reuse mine from other .308 rifles that I have, but to fit it in I have to remove the handle. Consider buying it from a local gun shop so you could bring the rifle in and ensure that it does fit. 4) .30 caliber cleaning patches. You can either buy them or make them yourself from an old bed sheet. 5) Cleaning fluid. Of all I've used, the BoreTech Eliminator and BoreTech C4 Carbon Remover are by far - by far! the best. Buy the biggest bottles you can find. $22 and $18, http://www.midwayusa.com/. 6) Oil. Break Free CLP is the best. Buy a 16 oz bottle. Overall, the cleaning supplies will set you back just around $100. Amazingly expensive for a $100 rifle, but you can reuse them for a different gun as well. 2) ...then move it back all the way. When it stops moving, depress the trigger and, continuing moving it, pull it out of the rifle. 3) Put the bore guide into the chamber. The handle on a bore guide imitates the bolt handle, and can be screwed in or out a little bit making the body slide along the tube. You will need to find exactly the right position so that the tube is inserted all the way, and the handle of the bore guide is locked in just like the bolt of the gun would be. Depending on the bore guide, the handle may have to be removed for the tube to fit. 4) First use the C4 remover. Follow instructions on the bottle, you may have to go through 5-6 cycles before the patch is coming out relatively clean. 5) Dry the bore out with 3-4 clean patches. 6) Switch to the Eliminator and do another 5-6 cycles with that until the blue hue (mostly) disappears. 7) Dry the bore out with 3-4 more clean patches. 8) Cover a patch with the liberal amount of Break Free CLP and run it through the bore. 9) Remove the bore guide. 10) Using a clean patch in a patch holder, push it into the chamber and rotate the rod back in forth so the leaks of the Bore Tech products are cleaned out. Repeat with the patch covered in Break Free CLP. 11) Using a patch covered in Break Free CLP, wipe the metal parts of the gun. The metal should be slightly oily, but not wet with oil. Excessive amount of oil will damage the stock and make the gun less accurate because of lessening the contact between the stock and the receiver.